Real estate investor David Marx is taking another crack at a hotel dream that the recession shattered, paying more than $30 million for a site that his lender Lehman Brothers seized just two years ago, Crain’s reported. The first time around, in 2007, Marx paid $45 million for the property at 448 11th Avenue, on the corner of West 37th Street across from the Jacob K. Javits Convention Center; his plans again call for a 210,000-square-foot hotel on the parcel, which is near another Marx development site at West 34th Street and 10th Avenue, according to Crain’s. The sale was brokered by HFF, which is led by Andrew Scandalios. Neither Scandalios nor Marx could not be reached by Crain’s for comment. Marx had to turn the land over to Lehman Brothers in 2011 after failing to secure construction financing. The financial giant put the property back on the market several months ago. The hotel would be the closest one to the Javits Center, which is undergoing a $400 million renovation and expansion. YIMBY has the latest news of the 42-story, 440-key Starwood hotel planned at 450 Eleventh Avenue, in the Hudson Yards District. Starwood lists it on their website as “Aloft New York Chelsea North” which will open in 2019. This is the latest article I could find on this new hotel. With 99-year lease in hand, developer Maddd Equities announces that it will build a huge property that will include either offices or a hotel in the lower floors and apartments above. 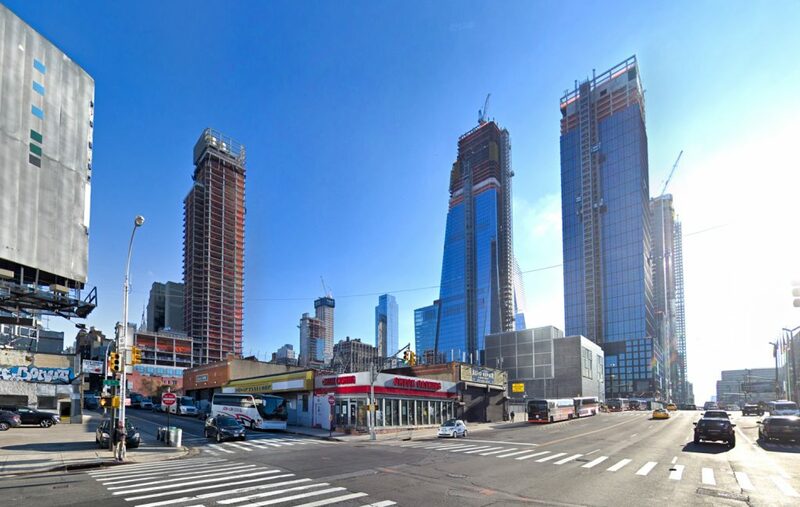 APRIL 11, 2014 1:57 P.M.
A huge building boom is gaining steam in Hudson Yards, the neighborhood west of Penn Station where millions of square feet of commercial and residential space are already rising. Maddd Equities, a real estate firm that has developed several residential projects in the city, has signed a 99-year lease for a site on the northwest corner of West 35th Street and 10th Avenue. 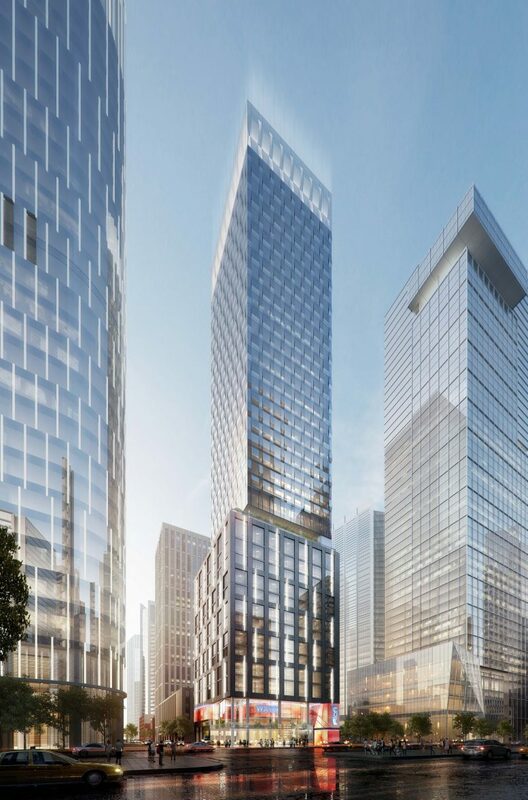 There it plans to build a 415,000-square-foot tower as tall as 700 feet, that would include either hotel or office space on the lower floors and residential units above. Mr. Weiss said he could not disclose how much the firm is paying for the leasehold that gives them control of the development parcel. The deal comes as the firm is about to break ground on a hotel project just across the street at 450 10th Ave. That project, Mr. Weiss said, will be a Four Points Sheraton Hotel. Mr. Weiss explained that the hotel the firm may develop at 451 10th Ave. would likely be a higher-end brand. 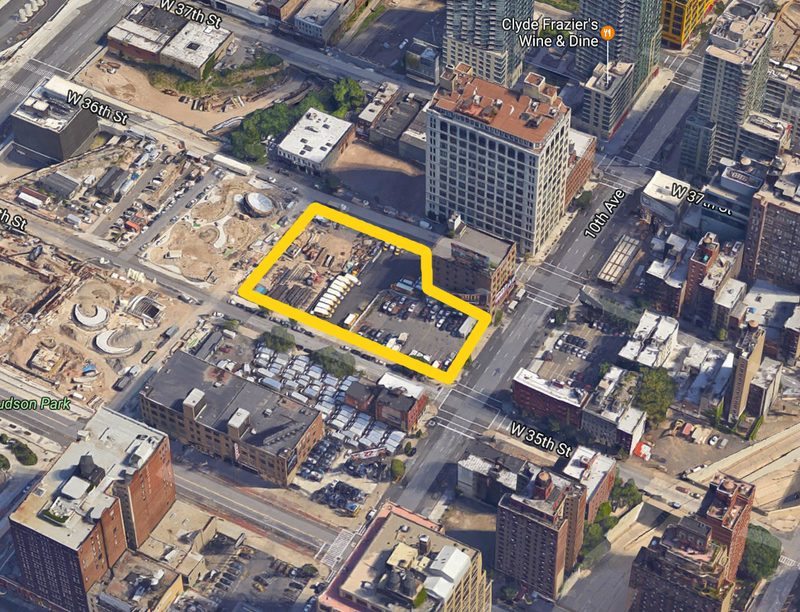 The deal is among several large development transactions that have been signed in the Hudson Yards area recently. As Crain’s reported Thursday, the development firm Black House, just acquired 470 11th Ave. where it plans to raise a 700-foot tall hotel and residential condo tower. 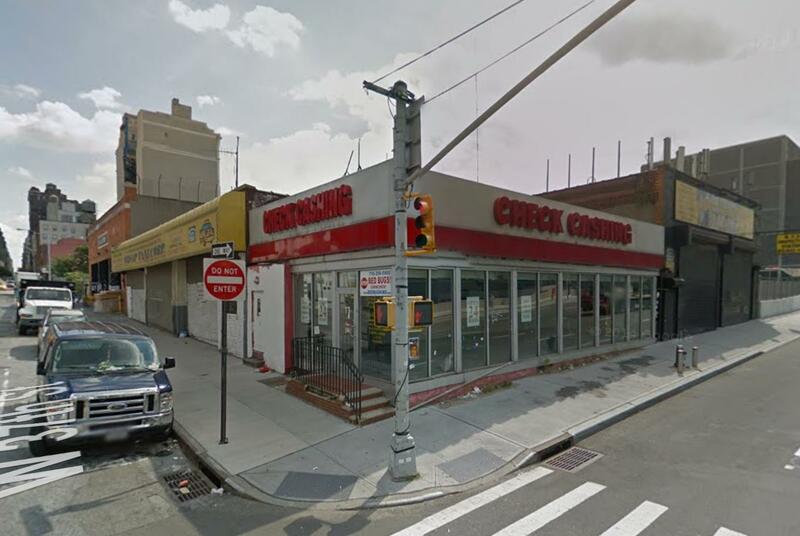 Former governor Eliot Spitzer also just bought a parcel late last year next door to Maddd Equities’ purchase, 511 W. 35th St. for $88 million, according to reports. It is rumored that Mr. Spitzer has been exploring a deal to expand that parcel by buying neighboring properties, including the building just to the north of Maxxx Equities’ site. A spokeswoman for Mr. Spitzer declined to comment on that deal. That looks way better than the previous crazy rendering! I wonder what the status of this is? Been trying to find info but no luck as of yet. Developer David Marx continues to put the pieces together for an upcoming Aloft hotel at 450 11th Avenue, refinancing the project with $67 million in loans, documents recorded by the city Friday show. Lender Cottonwood Management replaced an existing loan from Madison Realty Capital TRData LogoTINY with $55 million in new financing. Hong Kong-based Celona Asset Management provided an $11.9 million gap mortgage, records show. The Aloft (a Starwood Hotels and Resorts brand) will have 420 rooms when construction finally wraps. It’s been a long time coming, too — Marx’s Marx Development Group first set out to build the hotel at the site just across from the Jacob Javits Center in 2007. Marx did not immediately respond to a request for comment. This had me confused for minute. The Marx hotel is 450 11th Avenue, which is planned to be 42 floors. 451 Tenth was acquired awhile back by Eliot Spitzer who is planning a hefty 2-towered project with Related. YIMBY has the latest news of the two-towered mixed-use project planned at 511 West 35th Street, in the Hudson Yards District. Hopefully the got the zoning variance for the residential component. YIMBY has the scoop on the latest demolition news for 450 11th Avenue by Hudson Yards in Manhattan.